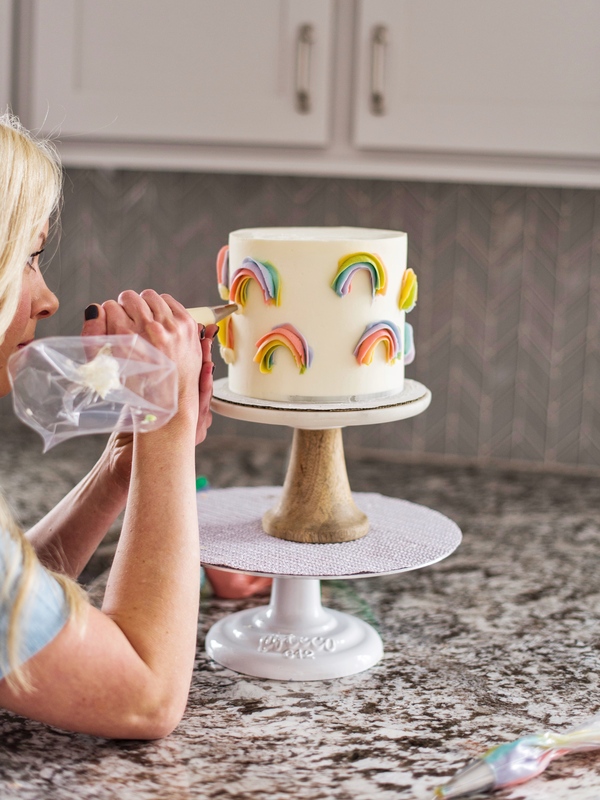 A step-by-step tutorial for creating the perfect buttercream rainbows. Okay, friends! I’ve got one more St. Patrick’s Day inspired cake for you to try out this weekend. These darling rainbows are so easy to create and so fun to make. 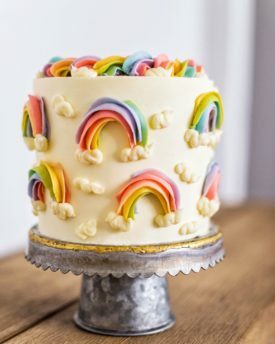 Plan on using about a half batch of my vanilla buttercream (recipe below) for the rainbows and clouds. Divide the frosting into seven bowls. Tint six of the bowls of frosting your rainbow colors and leave one bowl of frosting white for the clouds. 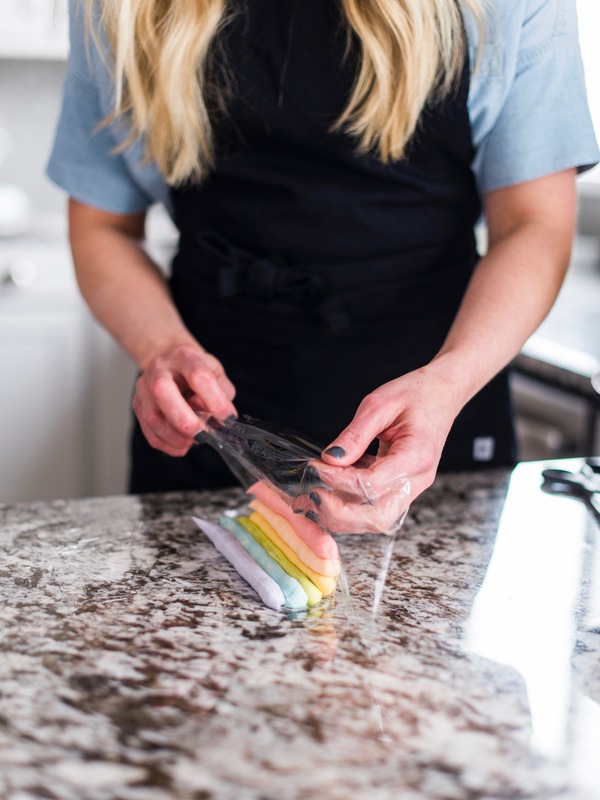 Place each color of frosting into a ZipLock bag and cut a corner off each bag. On plastic wrap, pipe a line (about 6-inches long) of each color. Make sure the colors line up and touch one another. Try to create equal amounts of frosting in each line. 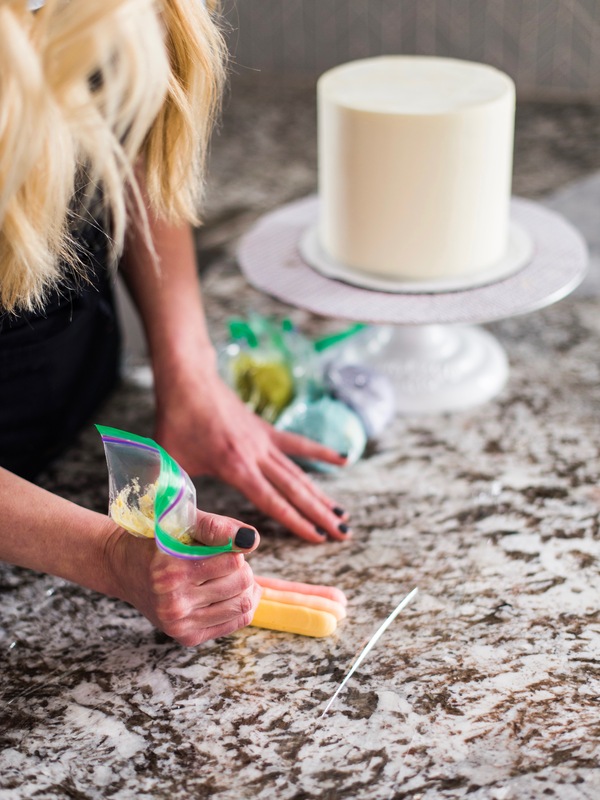 After you’ve piped all six colors, take the end of one side of the plastic wrap and begin to lift it up. 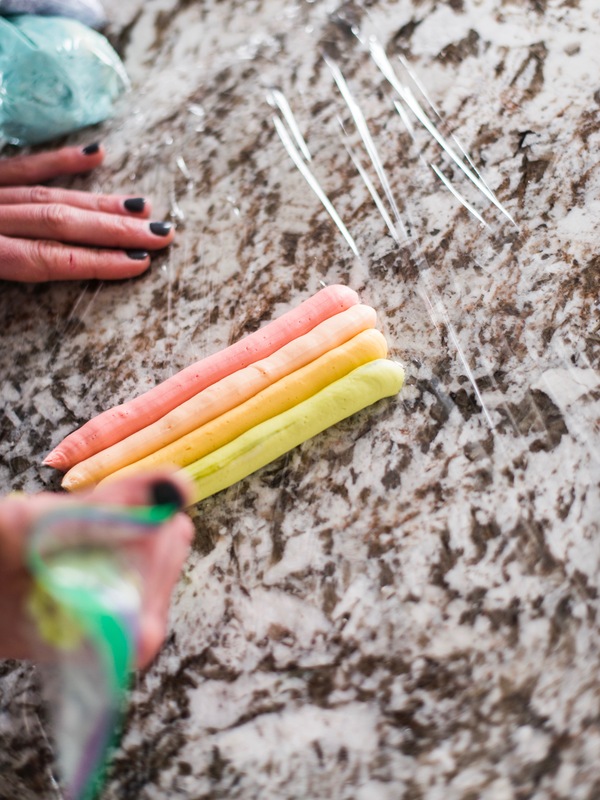 Carefully fold the plastic wrap and buttercream to create a circle of colors. 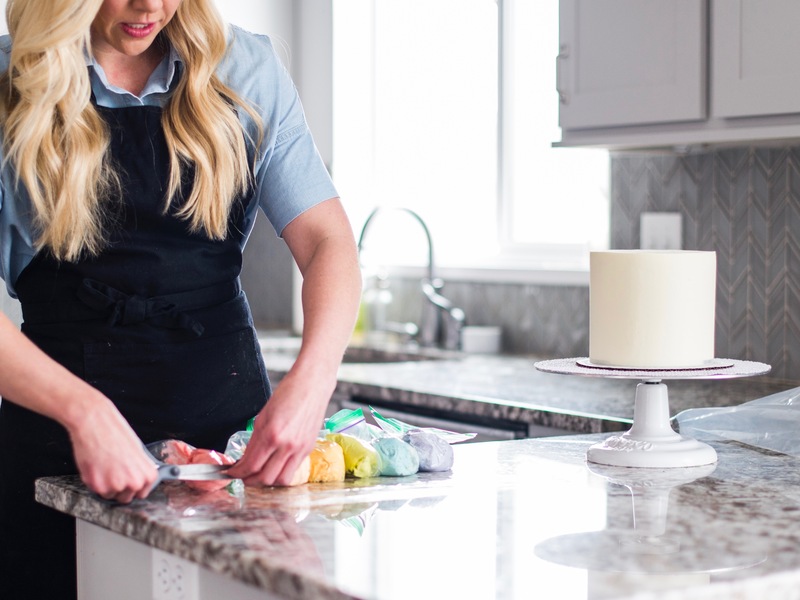 Be gentle as you fold the buttercream over so that you don’t smash the frosting and create uneven lines. After you’ve wrapped the buttercream, twist one end of the plastic wrap so the buttercream doesn’t come out. 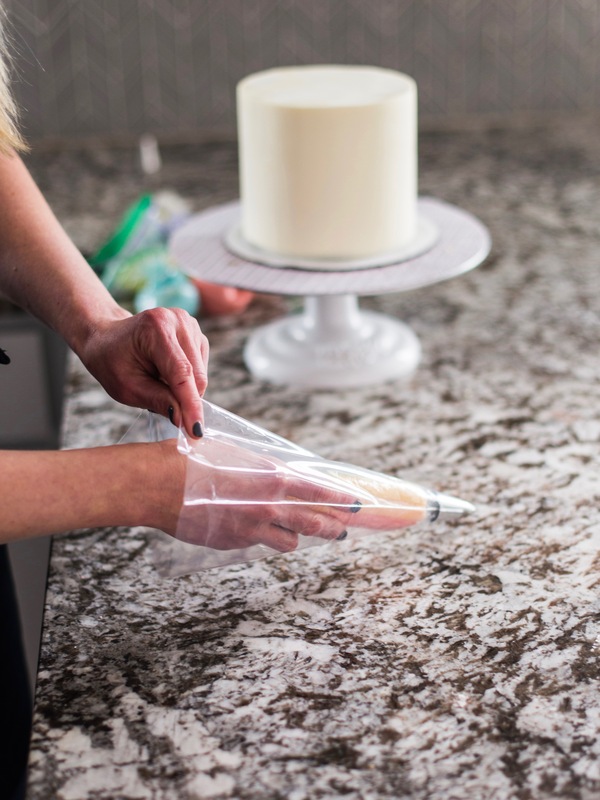 On the other end, cut the plastic wrap close to the buttercream. You’ll then place the wrapped buttercream into the piping bag fitted with the Wilton 1M tip. 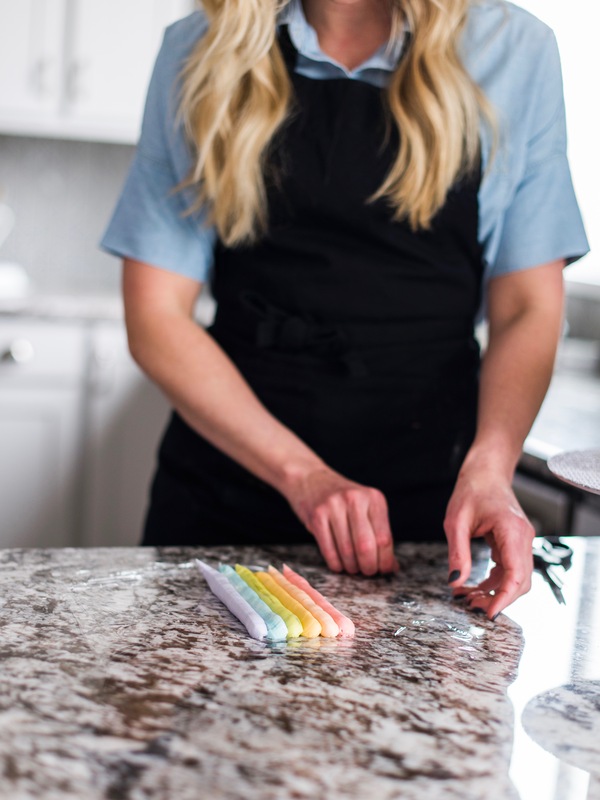 To create the rainbow, simply pipe a half circle onto a frozen or chilled cake. For best results, place your cake on a tall cake stand and the place the cake stand on your turn table. 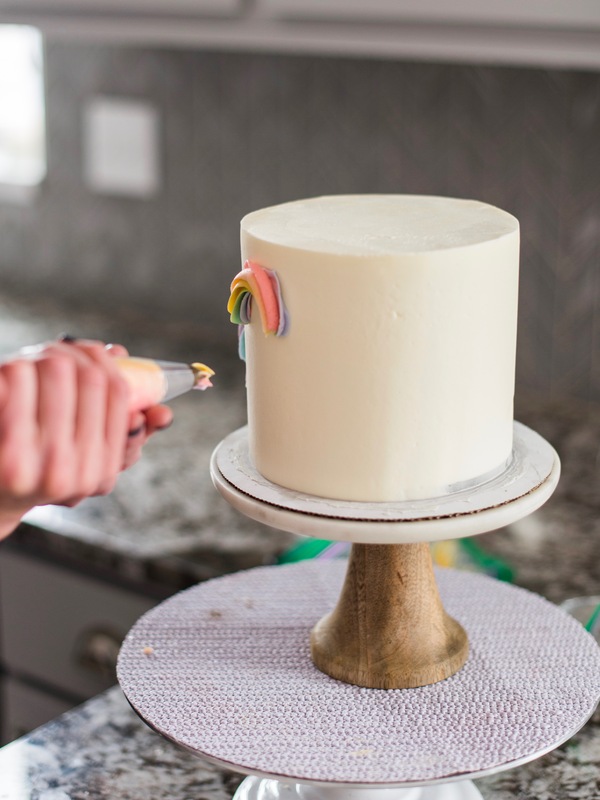 It will be much easier for you to pipe if you’re as close to eye level with the cake as possible. 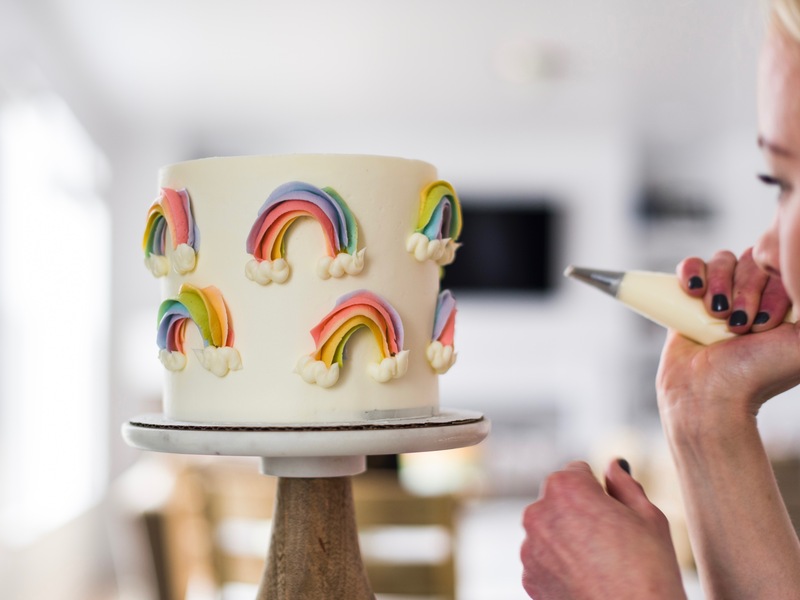 After you’ve piped all the rainbows onto the side of the cake, it’s time to pipe the clouds. 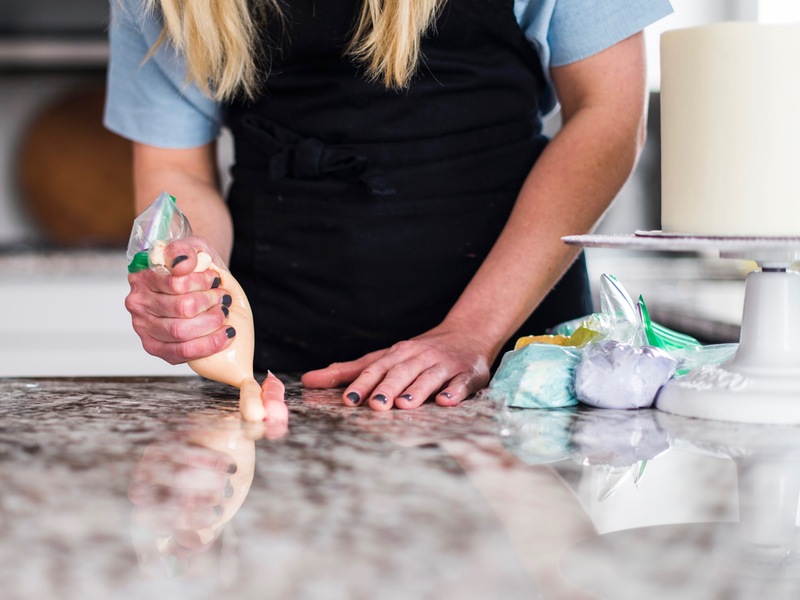 Place your white frosting into a piping bag fitted with the Wilton #10 tip. 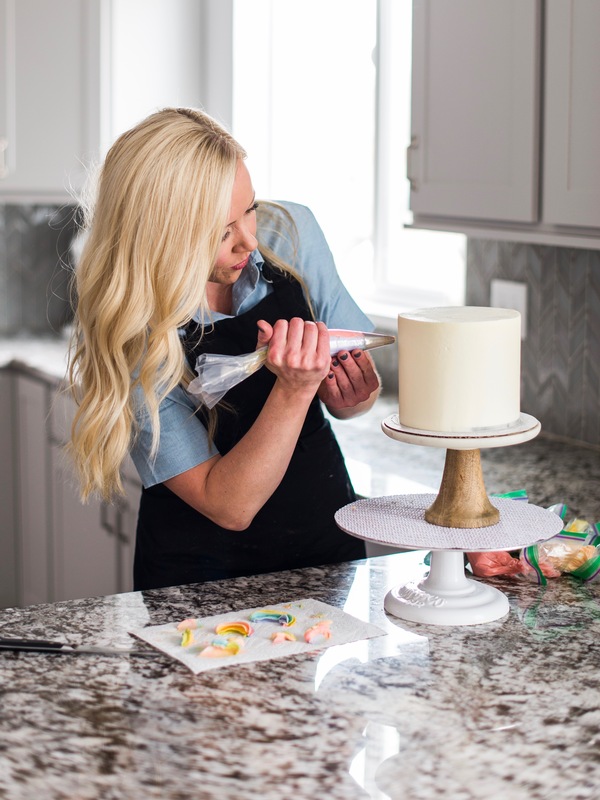 Again, positioning yourself as close to eye level with the cake as possible will make it much easier to pipe onto the side of the cake. 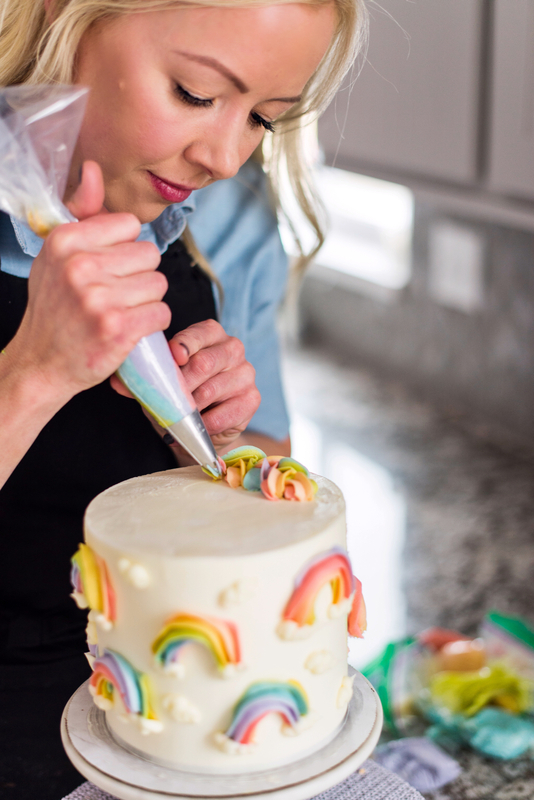 To finish off the cake, grab the rainbow piping bag again and create a braid around the top of the cake. I left about a half inch from the edge of the cake to where I started by rainbow. To see a video tutorial of the buttercream braid, take a look at my segment on Fox from December, when I used the braid to create a wreath. And that’s it! Easy peasy, right? Can’t wait to see you give this a try! In the bowl of a stand mixer fitted with the paddle attachment, cream the butter for about two minutes. With the mixer on low speed, gradually add sifted powdered sugar, one cup at a time, mixing a little in between each addition. With mixer on medium speed, add whipping cream, vanilla extract and salt. Continue to mix on medium speed for 6-8 minutes, until the frosting is fairly white in color and light and fluffy in texture. 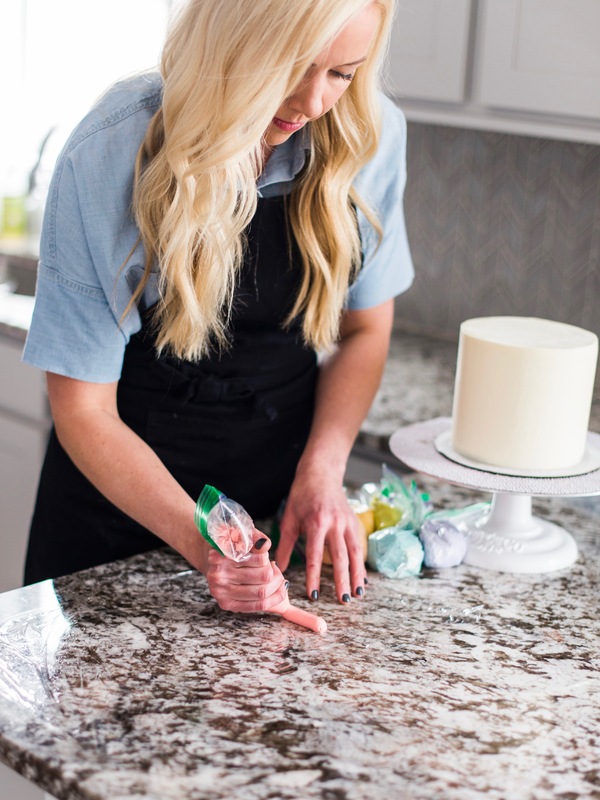 Yes, I’m actually working on a new post for it this week, but if you need it before I post, use the vanilla cake from my Funfetti Cake (just without the sprinkles). well this is just amazingly gorgeous and magical! what a lovely treat to gift to a special loved one! 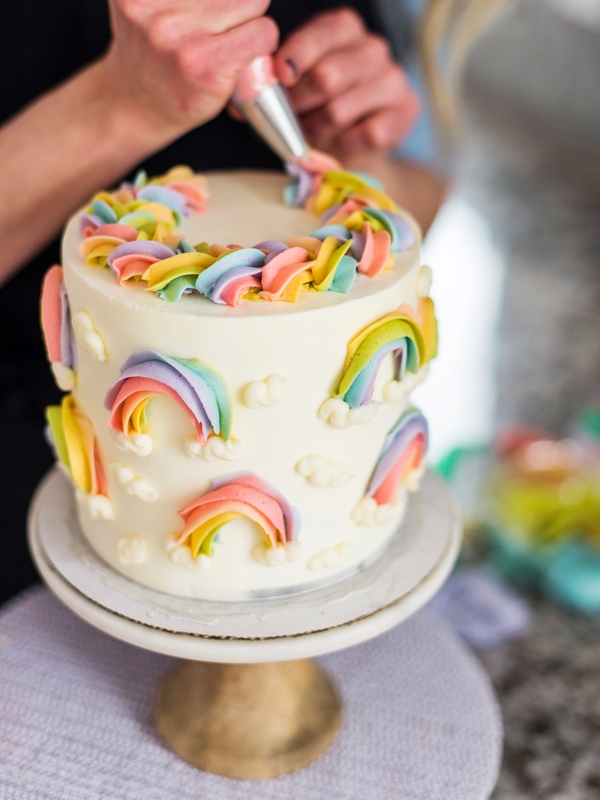 Can u do video tutorial on this rainbow frosting on cake? 1. You say to cut the frosting recipe in half for the rainbows and clouds. Is that half of the recipe is for the cake and half for the rainbows and clouds? Or is it half in addition to what is used for the cake. We are dairy free, so I am going to use shortening. What is the function of the whipping cream so I can think of a sub. Is it thickening, or to make the frosting stiffer? Sorry for the questions I LOVE YOUR CAKES, SITE and help!! What size cake pan did you use to make the rainbow cake?